Yale’s Robert Shiller believes a bond crash is coming, although he stops short of saying when or why. 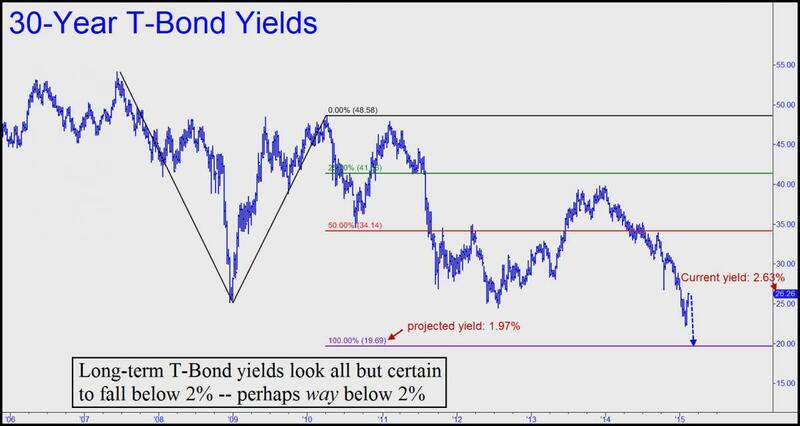 In a recent interview with CNBC, the Nobel Prize-winning economist offered no rationale for a collapse in T-bonds other than that yields are too low. Well, yes, they’ve been held near zero by the Federal Reserve for several years, and there is nothing normal about that. Obviously, something’s got to give. As the late Herb Stein famously said, if something can’t go on forever, it will stop. But when? And why? Shiller’s interviewer did not think to press him for an answer, although he’s a full-fledged oracle in a mainstream-news world where anyone who uses the word “crash” risks being treated like a circus freak. To be sure, the crashes Shiller is credited with predicting correctly were the easy ones. Quite a few gurus in the not-ready-for-prime-time blog world saw them coming – shouted warnings from the rooftops, as the record will attest. Even the village idiot could have seen the housing crash coming (although, as John Paulson demonstrated, it took a devious kind of genius to figure out how to cash in on it). But when you predict, as Shiller has, that the T-bond market will collapse – which is to say, deflate or hyper-inflate itself into oblivion — you are effectively forecasting the end of the financial world as we know it. That kind of talk may not fly on CNBC, but in the blog world it is a given not only that a collapse is inevitable, but that anyone who argues that it can be postponed indefinitely is unworthy of a thinking person’s attention. My guess is that although Shiller sees the Big One coming, he has stopped short of describing the endgame, even in his latest book, because he doesn’t want to be relegated to the lunatic fringe. Peter Schiff, another high-profile seer, seems less concerned about how he appears, perhaps because his success as an author and public speaker allows him to laugh all the way to the bank regardless of what he says. However, as has become much clearer over the last two years, his forecast of hyperinflation is at odds with the reality of a deflationary bust that has been gathering irresistible force in Europe, Japan, and now even China. To finish Shiller’s thought, if I may be so bold, and speaking as a hard-core deflationist, the collapse to which he has alluded is by now inevitable — but not before deflation has wrung out some of the very biggest players, including U.S. multinational banks and manufacturers, far beyond the point of mere pain, as has started to occur. This is happening because of the dollar’s wholly unforeseen, largely unwanted and by-now-out-of-control strength. The trend is only in its adolescence, and I don’t expect it to climax until yields on the 30-Year Bond fall below 2%. This is clear in the chart above, which shows T-bond rates falling from a current 2.62% to at least 1.97%. With just a small adjustment in the chart, and using our proprietary Hidden Pivot Method of analysis, it’s possible to project a further decline in long-term rates to as low as 1.63%. My hunch is that if yields drop to that level, it will be on a fleeting spike caused by a global panic into the relative safety of U.S. Treasury paper and the dollar. Hyperinflation could occur at any time thereafter, particularly if the Fed attempts to monetize not merely financial assets, as it has been doing, but the cash needs of city, state and federal governments strapped to meet pensions and health care obligations. Taxpayers would never stand for such a thing, of course, but the likely result is something we’ll leave to the blog world to describe in not-yet-ready-for-prime-time detail.